– The war has been going on for seven years in Syria, hundreds of thousands have fled the country. What gave you strength to stay? Joseph Kassab: This is a matter of loyalty: the question is are we loyal to God? We can’t build this upon rational arguments, otherwise we have long been gone by now. I believe our pastors in Syria don’t think too much about this, they are simply loyal to their God. And God teaches us through these trials to remain loyal to Him who has called us at our place. Haroutune Selimian: I’ve never thought about the strength keeping me in Aleppo but I’m sure it’s coming from within not from outside. This solid intention this commitment towards the people and our service among them can be renewed through our prayers. Perhaps I can shed light on this through the words of Jeremiah. „For I know the plans I have for you – declares the Lord – plans to prosper you and not to harm you, plans to give you hope and a future.” It took me years to understand the truth behind these words in my life and obey. But now I know: God has a plan for me even if war, violation and death surrounds me. He plans peace and prosperity and uses my commitment in realizing these as well. This is why I can still put up with misery. Joseph Kassab is an Syrian pastor born in Aleppo. He studied applied chemistry, later theology in Bejrut and at Princeton University. 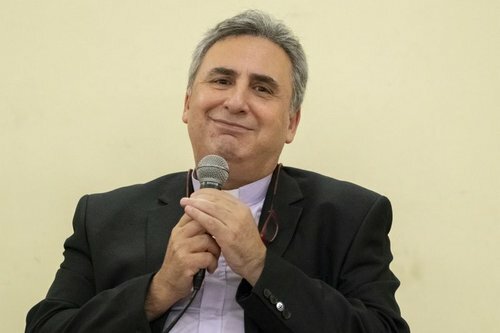 He was the General Secretary of the National Evangelical Synod of Syria and Lebanon between 2004 and 2008. He’s been holding this role since 2015 once more. His wife, Najla Kassab is the President of the World Communion of Reformed Churches. – How does persecution affect the churches? Joseph Kassab: the road to humanity often goes through violence. Jesus told his apostles: „I'm sending you out like sheep among wolves”. Germany did terrible things during World War II but the country has changed, it became a more tolerant place where people value humanity more than before. It is horrible what’s happening in the Middle East but through this we can evolve. Political Islam may be changed through the persecution of Christians. Before the war we had also cared more about our own communities we had been operating almost like clubs but the past had changed us, our churches discovered the deeper meaning of their existence. Haroutune Selimian: You might think that persecution equals the end but I also think that misery and progress go hand-in-hand. If you take Paul for instance: first he was a terrorist threatening Christians in Damascus but he later became a blessing for the whole world. Today’s extremists whose targets are the Christians of Syria only want to scare us but instead faith evolves. Before the war our community had 150 members today not a single congregation in Aleppo has less than 300 members. Our churches became a sanctuary for everybody. A place to renew a place to regain their strength because the church advertises the message of hope we’ve got from God. Those who’ve met this kind of faith became believers themselves as well. These days I need to start thinking about where I will seat these many people on Sunday already in Saturday evenings. Haroutune Selimian is an Armenian Reformed pastor and also the President of the Armenian Evangelical Community in Syria since 2004. He studied in Beirut, Chicago and Switzerland. 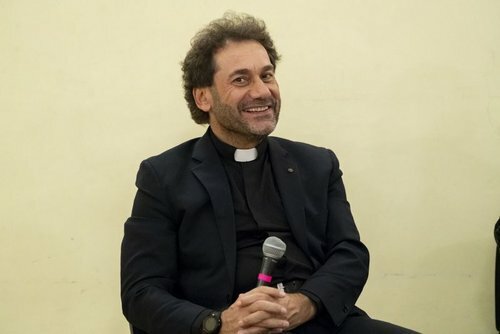 He is the pastor of the Bethel Church in Aleppo since 1992 and he was also the organizer and host of the RCH solidarity visit to the Middle East last December. – The history of education and the Reformed church go hand-in-hand in Hungary. Is this the same in the Middle East? Haroutune Selimian: Education has always played an important role not only in the life of our church but in our culture. It is not by mistake that churches and schools have always been built right next to each other since the establishment of our Church in 1846. Since the genocide in the early 20th century we’ve been living in many parts of the world. But wherever you see an Armenian church you’ll find a school right next to it as well. Haroutune Selimian: Because we believe in education. We believe that God’s words have to be present in the school system as well. We need to handle science and education as Christians and we need to pass on our norms, our thinking and our way of life. Without these we won’t be members of the Reformed Church in the Middle East. We need to accept that schools support our families because thanks to them freshly married couples remain close to the church at least for 18-19 years. Our institutions are open to the society – to Armenians, Muslims, Christians and Arabs – because we believe that we need to share what we have. Many Muslims admire our school system, our commitment and Christian values they gladly send their children to us. Joseph Kassab: In 1900, 100 schools operated on the territory of today’s Syria and Lebanon. Most of them were maintained by different churches. Pastors, their wives and educated members of the churches taught the children. Later as the state education system was launched, many church schools were shut down. Currently we have 11 schools with 10.500 students. Most of them are not even Christian, but Shi’ites, Sunnis or Druze. This is a huge opportunity for us to show Christianity to them and change their mentality. They not only learn math or chemistry from us, but tolerance, openness and acceptance as well. In Lebanon for example, all classes elect a president – the students run their own campaigns for two weeks – this way we can teach them how democracy works. Not a single student – let them be Muslim or Christian – of ours participated in the civil war of Lebanon. I’m certain that the future of Syria can be built upon education. – How can parents afford to choose your schools for their children instead of the ones run by the state? Joseph Kassab: Compared to the average earnings in Lebanon, private schools are very expensive. Even so, 70% of students attend private schools as their parents don’t think state-owned schools can guarantee the future success of their children. The tuition fees of Syrian students are sponsored by – among others – the Swiss Church Aid (HEKS) and through them the Reformed Church in Hungary. We are proud of the fact that last year we had a student whose tuition fee was almost entirely sponsored by these sources. We are very grateful for every support we get. Haroutune Selimian: In our schools we only have small, symbolic tuition fees and when we offer scholarships we don’t discriminate anyone based on their religion. Muslim students get scholarships just as Christians. 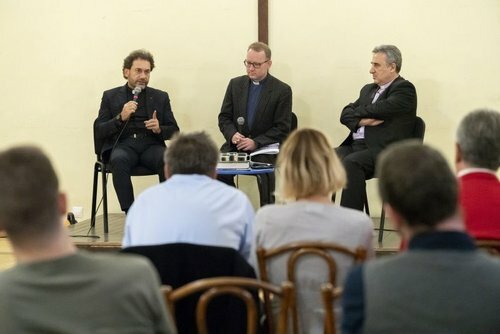 – What can you tell us about the relationship of different religions? Haroutune Selimian: Dialogue between different churches is not an invention of today. In times of the New Testament Syria had been a Christian country, 600 years later it became a Muslim one. But Christian congregations have been operating ever since. We’ve been living together for 1300 years partnership is in our DNA. Though we are the minority at the moment, Muslims are open to us as they find our culture valuable especially our school system. We’ve been working, shopping at the same places, we’ve never cared about what kind of religion the other had. The war shed light to the fact that the search for differences is more like a result of western thinking. – What do you think about European Christianity? Joseph Kassab: The European culture is the result of Christianity, this way it is a Christian culture but along the way they’ve reached this, they’ve also lost something. Please understand: I myself consider the achievements great – for example the separation of the Church and the State, the integration of men and women or the respect of human dignity – but I also see some things missing. God’s unbounded love with which He changes our lives should overawe us every day. This wow feeling seems to be missing from Europe. 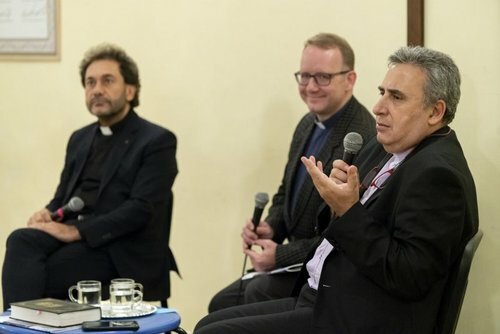 During their five-day visit the leaders of our Middle Eastern partner churches learnt about the mission and educational work of RCH and they’ve also met Bishop István Szabó, President of the Synod of RCH. Our partners visited Debrecen, and also had a meeting with the Hungarian Prime Minister Viktor Orbán who offered two million Euros to support the educational and social operation of the two Reformed Churches in Syria. The two leaders of the Middle Eastern Churches also participated in the event of the Ministry of State Secretariat for the Aid of Persecuted Christians at the Prime Minister’s Office.